August 29, 2003 - Acroprint Time Recorder Co. introduces their NEW Fast and Easy to use Electronic Time Clock, the ATR120. 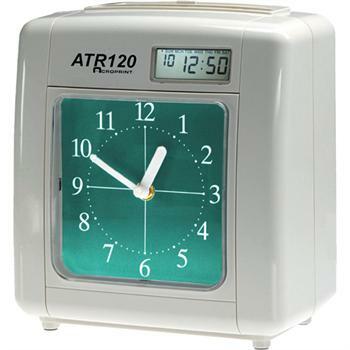 The ATR120 is a High Quality, Value Priced time clock that is perfect for any office environment. This attractive time clock has a large easy-to-read Green Clock Face and a Digital Time Display. The clock can easily be mounted on a wall or desktop. The ATR120 is a top loading time clock, which allows automatic day/date positioning. This clock is Always on Time - It can maintain time during power outage, has a built in Perpetual Calendar that automatically makes day/date & month changes, Daylight Saving and leap year adjustments. The ATR120 is versatile; it can be used for either weekly or bi-weekly pay periods. The Time Clock Administrator can program a signal to signify “start” and “stop” times; additionally the time clock has two-color printing to show early and late punches - both features make it easy to keep track of employees’ arrivals and departures and makes time card editing easy. The ATR120 also has the flexibility for the user to select print format: Day, Hour, and Minute, 12 or 24 hour format. April 18, 2008 - Acroprint is pleased to announce the extension of their product line's new contemporary look to their ES700 and ATR120 electronic time recorders. The classic black and silver color scheme these clocks share with the recently-updated ES900 time stamp is designed to coordinate with today's office décor while concealing smudges and fingerprints. The new finish offers a clean, professional appearance even in high-traffic environments.